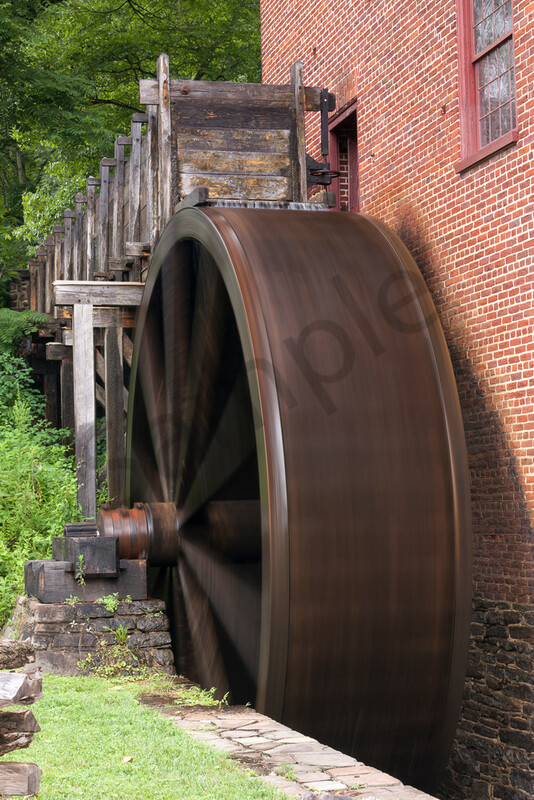 A fine art print of "Water Wheel Turning" feels right at home in a kitchen, hallway or office space. Rotating against Colvin Run Mill, the large water wheel is remarkably quiet. Morning sun warms the wood, stone and brick saturated from evening showers. The love and hard work of the community allows the mill to produce cornmeal, flour and grits more than 200 years after its original construction. Honor their efforts with a print! This fine art print of "Water Wheel Turning" is part of my Countryside Wall Art series. Nodding to the past, the large wheel, heavy timber and brick walls provide a solid framework for your home decor. Best displayed on canvas, the textured surface faithfully captures time-worn details. The earthy hues are radiant, resembling the warm sunshine. Canvas prints are available on a 3/4" or 1 1/2" frame, ready to hang and enjoy. For a bolder, crisper look that captures the imagination choose a metal print. Each metal print is ready to hang without a frame. Two museum-quality fine art papers are also available, should you prefer a more traditional look.